Ever since adding a bar cart to my home office, I've been dreaming up ways to style it for different occasions. 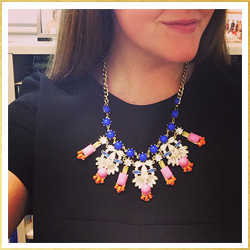 Of course, styling it for the holidays is tops on my list. 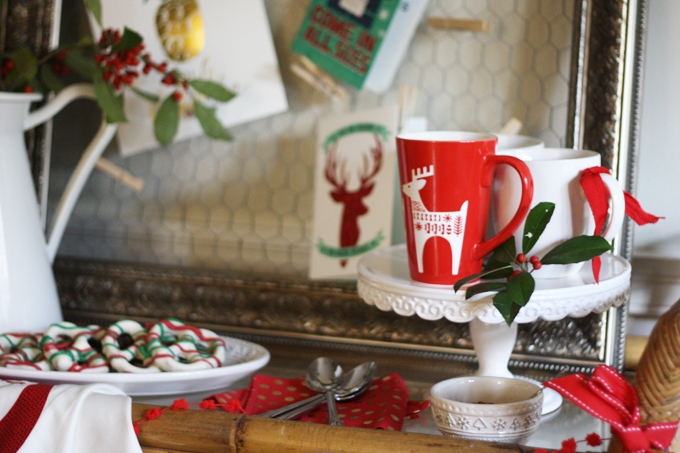 Today, I'm sharing with you how I styled a holiday hot cocoa bar cart. I am absolutely over the moon to share this post with you. The concept is something I've been dreaming up for a while, and to be able to put it into a post for you with a company like Hallmark is a dream. Hallmark is well-known for their fabulous selection of greeting cards, but have you ever noticed their equally amazing selection of decor? 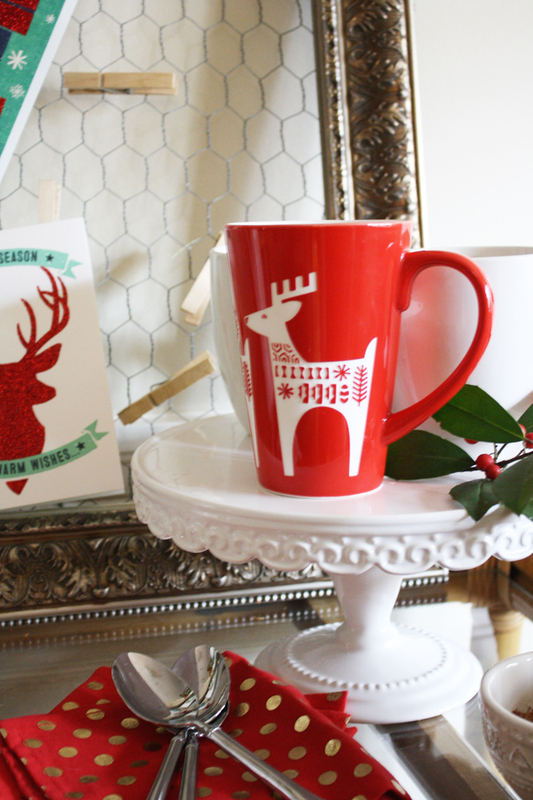 This holiday season, holiday decor at Hallmark is not to be missed! You can do so much with it that the possibilities are truly endless. Last week, I dipped into my local Hallmark store to take a peek around their selection. 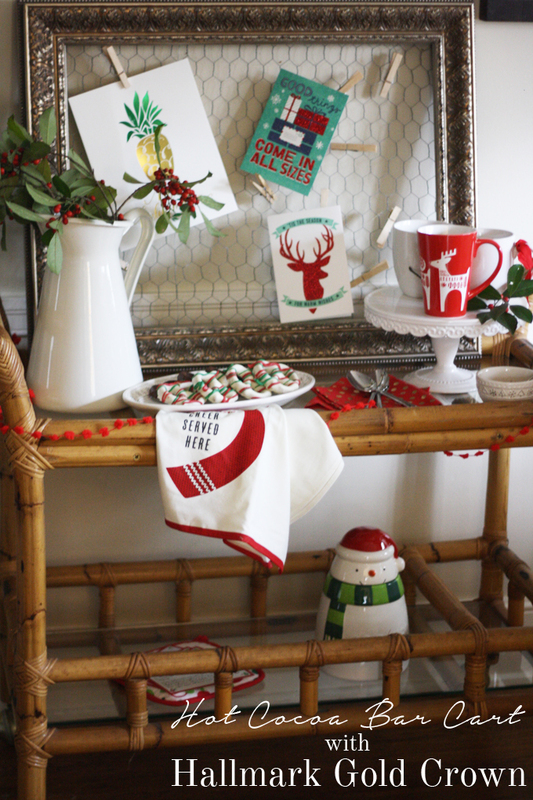 I had styling a hot cocoa bar cart in mind, so I went into the store with focus and purpose...but I couldn't help but get whisked away by holiday items at every turn. I was especially smitten with their Enchanted signs and could definitely see them in my home. However, I was a lady on a mission with bar carts on the mind. 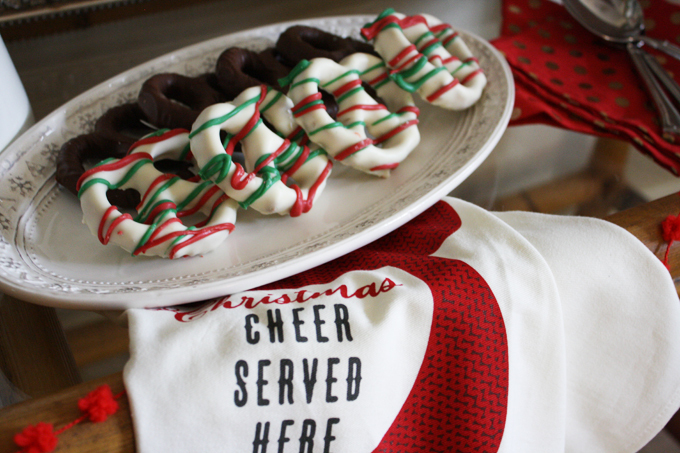 I scooped up an adorable etched mug, a tea towel, pom pom ribbon, a few cards, and some delicious Crafters and Co chocolate covered pretzels. 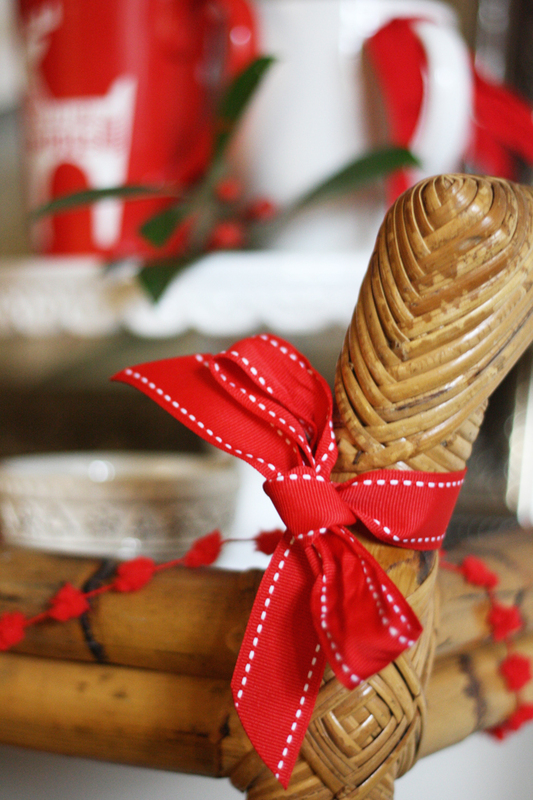 I knew this would make a great start to my hot cocoa bar cart. When I got to the register, I found out that Hallmark was celebrating their Holiday Open House (now until November 15th while supplies last) which meant that my loot more than doubled! I walked out of Hallmark with a chips and dip platter, a beautiful porcelain gift tag, a cookie jar, recipe cards, an ornament, a pot holder, & a reusable tote bag...FOR FREE! Say what?! And, I only spent $50. To say I was excited would be an understatement. When I arrived home, I couldn't wait to put everything together. Watch my YouTube video below for a quick tour of how to put your own hot cocoa bar cart together, or read on for full details. 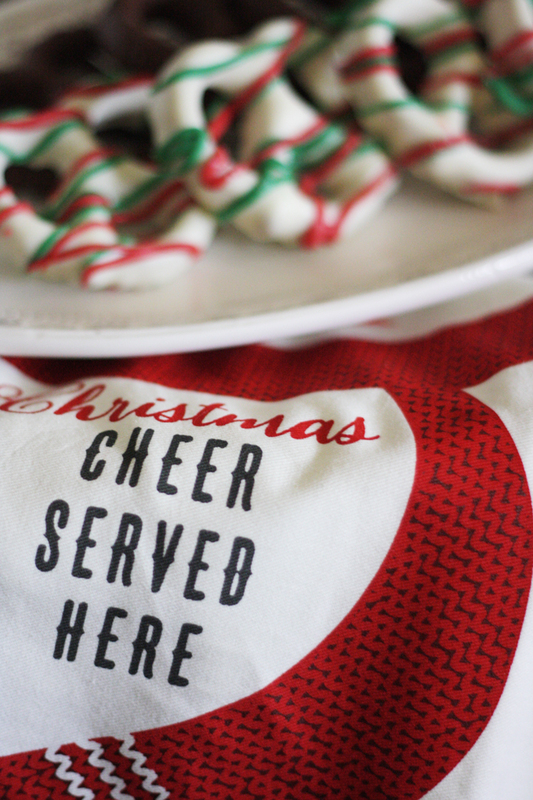 I used the pom pom ribbon to add a little holiday pizzazz to my cart. The punchy red gave the cart just the pop I was looking for. Next I layered on all of my Hallmark goodies. From the pretzels to the mug, everything had its place. 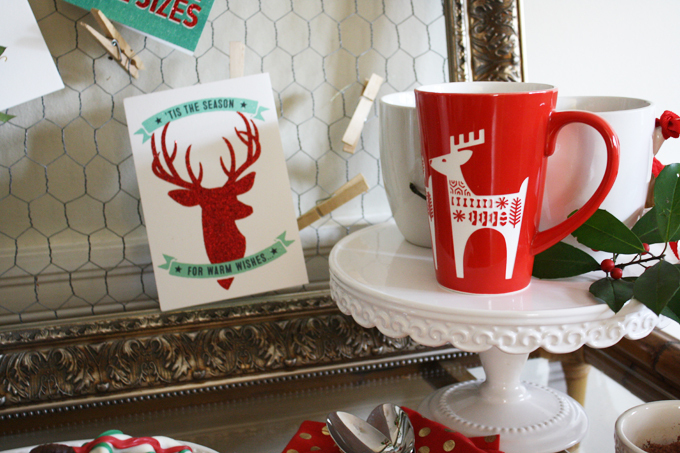 Need a spot to display all of those holiday cards that will be coming in the mail? 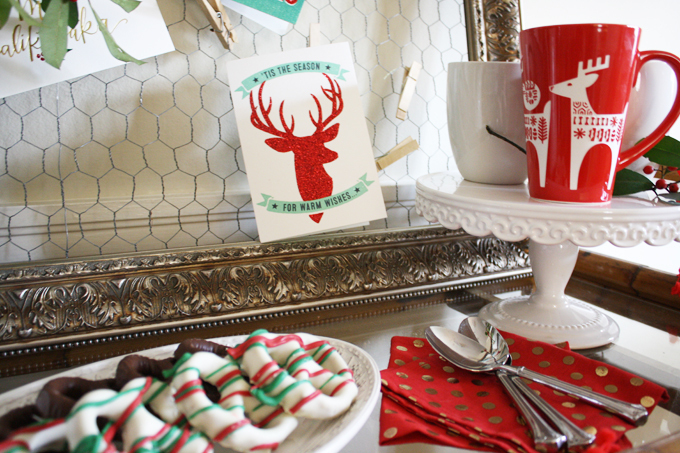 Why not pin them over your hot cocoa cart? I placed mine on this DIY chicken wire frame using wooden clothespins. 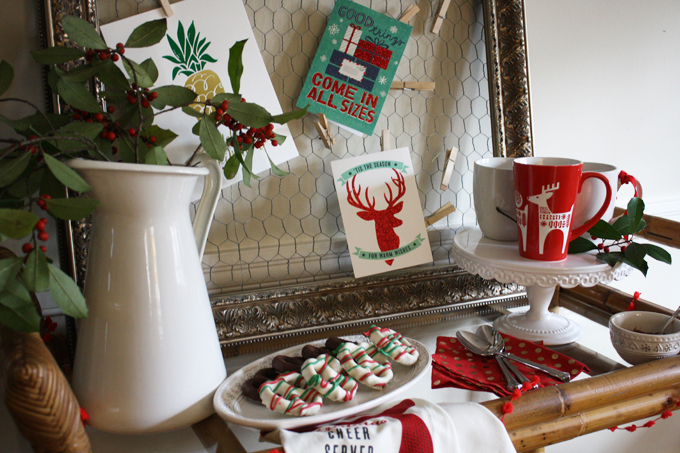 Achieve the same look by adding some garland or ribbon above your cart creating a clothesline of Christmas cards. It's a cute and easy look, not to mention a fabulous storage solution! I'm so excited to have friends and family over this holiday season. 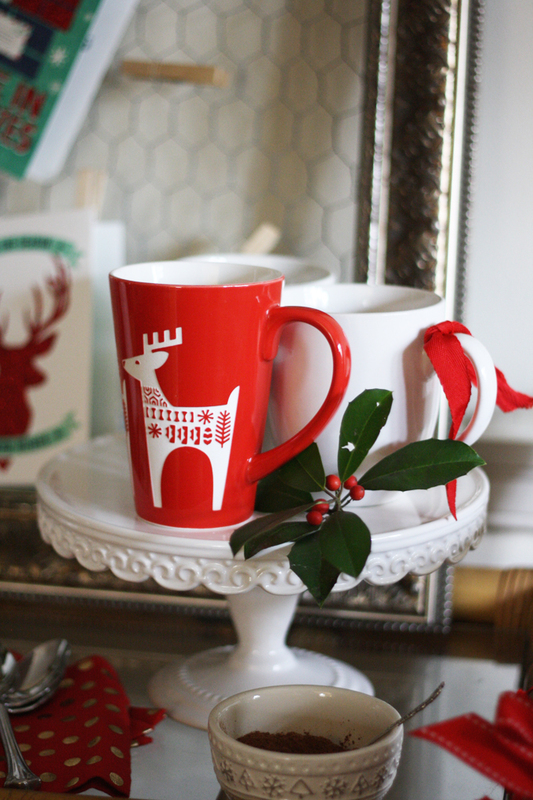 We can use our coffee maker to make warm water quickly then they can use all of my Hallmark holiday treasures to prepare a steaming cup of hot cocoa. This is BEAUTIFUL!!! I'm so impressed!! What a beautiful bar cart - I'm going to need to start working on my own now! SOOOOO pretty! That's so adorable! I love all the little details. Thanks, Becca! The details are what makes it for sure. I appreciate you commenting! Thank you, Sabrina! Be sure to pick one up at Hallmark. There's a white version, too :) I see lots of cheerful coffee in your future! Love this idea! Who would have thought you could get all this at Hallmark! Thanks, Stacie! It's really incredible what Hallmark has to offer these days. I can't wait to see what else they come up with this season!